I hold a Ph.D. in mineral processing and I have more than 13 years industrial and academic experience. My goal is to learn how to implement fundamental understandings in my research for offering solutions to minerals industry and also educate engineers and researchers with problem solving skills for tackling future challenges of our industry. Planning and implementing multi-disciplinary projects in comminution, flotation and thickening for numbers of funded industrial project provided me with a strong desire to conduct applied research underpinned by sound fundamental understanding. Having opportunity of being in a high calibre research team in the JKMRC, a world leading research centre in mineral processing, and actively collaborating with the international community of researchers has broadened my vision on issues associated with minerals industry. In light of that vision, I have focused my research on a new approach in ore characterisation for comminution which is a crucial step in the path way toward developing mechanistic breakage models. However, I am still continuing the research I did in my Ph.D. to develop a predictive liner wear model. The joy I experienced as a superintendent engineer in a coal processing plant always keeps me motivated to conduct industry based projects. 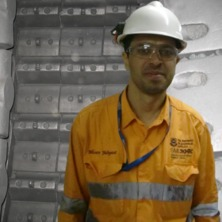 Coordinating and conducting a couple of successful industrial surveys in Iran and Australia's most recognised mine sites, is due to my passion for being on mine sites and be involved in real world issues. Working with large processing plants which have a high level of safety standards made me an expert in the assessment of safety and risks of conducting industry-based research. Leading a large group of researchers and students and collaborating with site personnel is another invaluable skill I learned while conducting site work. I enjoy presenting my research outcomes to the international research community and discussing the future challenges of mineral processing. I have a great honour of being in the JKMRC which offers a sustainable process for the minerals industry. I have a successful background in industry-based work which enables me to speak with industry in a practical sense. Therefore, my connections with industry have grown substantially in the past few years. This enables me to become a self-sustainable researcher for funding my basic research. I received a good response from industry regarding the "Mill internal design and management" project and I was able to acquire funding from industry and university through applying for competitive grants. My background and publications in different areas of mineral processing such as comminution, dewatering, coal processing and flotation are recognised by universities, conferences, and journals and I have been asked for examining thesis for different universities internationally, and reviewing journal articles and conference papers in all of these areas. Working in JKMRC introduced me to a wider research community and offered me opportunities of working with more mine sites, suppliers and engineering companies which make me feel satisfied as an applied researcher. Powell, M. S., Bonfils, B., Ballantyne, G. R., Yahyaei, M. and Hilden, M. M. (2019). The new suite of breakage characterisation tests. In: IMPC 2018 - 29th International Mineral Processing Congress. 29th International Mineral Processing Congress, IMPC 2018, Moscow, Russia, (434-453). 17- 21 September, 2018. Maleki-Moghaddam, M., Yahyaei, Mohsen and Banisi, Samad (2016). GMT: a spreadsheet-based software to predict charge shape and trajectory in tumbling mills. In: IMPC 2016: XXVIII International Mineral Processing Congress Proceedings. XXVIII International Mineral Processing Congress, Quebec City, Quebec, Canada, (). 11-15 September 2016. Saeidi, Fatemeh, Yahyaei, Mohsen, Powell, Malcolm and Marcelo Tavares, Luis (2016). Understanding single particle breakage event to evaluate the effect of applied strain rate. In: IMPC 2016 Conference Proceedings. XXVIII International Mineral Processing Congress Proceedings, Quebec City, Quebec, Canada, (). 11-15 September 2016. Yahyaei, M., Weerasekara, N. and Powell, M. (2015). A study of the effect of particle size on surface breakage in a pilot mill. In: Magnus Evertsson, Erik Hulthén and Johannes Quist, Proceedings of the 14th European Symposium on Comminution and Classification. 14th European Symposium on Comminution and Classification, Gothenburg, Sweden, (212-216). 7-10 September 2015. Maleki-Moghaddam, M., Hasankhoei, A. R., Arghavani, E., Haji-Zadeh, A., Yahyaei, M. and Banisi, S. (2015). Evolution of Ag Mill Shell Liner Design at the Gol-E-Gohar Iron Ore Concentration Plant. In: Bern Klein, Kelly McLeod, Reem Roufail and Fisher Wang, International Conference on Semi-Autogenous and High Pressure Grinding Technology 2015. The 6th International Conference on Semi-Autogenous and High Pressure Grinding Technology, Vancouver, BC, Canada, (1-12). 20-24 September 2015. Powell, Malcolm S., Mainza, Aubrey N., Hilden, Marko H. and Yahyaei, Mohsen (2015). Full pre-crush to sag mills – the case for changing this practice. In: Bern Klein, Kelly McLeod, Reem Roufail and Fisher Wang, International Conference on Semi-Autogenous and High Pressure Grinding Technology 2015. The 6th International Conference on Semi-Autogenous and High Pressure Grinding Technology, Vancouver, BC, Canada, (1-22). 20-24 September 2015. Yahyaei, Mohsen, Limpus, Andrew, Russell, John, Toor, Paul and Powell, Malcolm (2015). Improving liner design for efficiency. In: Bern Klein, Kelly McLeod, Reem Roufail and Fisher Wang, International Conference on Semi-Autogenous and High Pressure Grinding Technology 2015. The 6th International Conference on Semi-Autogenous and High Pressure Grinding Technology, Vancouver, BC, Canada, (1-15). 20-24 September 2015. Masuret, C., Yahyaei, M., Weerasekara, N. and Powell, M. (2015). Measuring shear abrasion breakage of rocks using a novel characterisation experiment. In: Magnus Evertsson, Erik Hulthén and Johannes Quist, Proceedings of the 14th European Symposium on Comminution and Classification. 14th European Symposium on Comminution and Classification, Gothenburg, Sweden, (81-86). 7-10 September 2015. Saeidi, Fatemeh, Marcelo Tavares, Luis, Yahyaei, Mohsen and Powell, Malcolm (2015). Modelling single particle breakage as a multi-stage process. In: Magnus Evertsson, Erik Hulthén and Johannes Quist, Proceedings of the 14th European Symposium on Comminution and Classification. 14th European Symposium on Comminution and Classification, Gothenburg, Sweden, (47-52). 7-10 September 2015. Ballantyne, Grant, Powell, M. S., Bonfils, B. and Yahyaei, M. (2015). Simple energy measures for assessing total circuit efficiency. In: 6th International Conference on Semi-Autogenous and High Pressure Grinding Technology, Vancouver, Canada, (). 20 - 24 September 2015. Engelhardt, Dieter, Seppelt, Joe, Waters, Tom, Apfelt, Andy, Lane, Greg, Yahyaei, Mohsen and Powell, Malcolm (2015). The Cadia Hpgr-Sag Circuit – from design to operation – the commissioning challenge. In: Bern Klein, Kelly McLeod, Reem Roufail and Fisher Wang, International Conference on Semi-Autogenous and High Pressure Grinding Technology 2015. The 6th International Conference on Semi-Autogenous and High Pressure Grinding Technology, Vancouver, BC, Canada, (1-18). 20-24 September 2015. Yahyaei, M., Vos, F., Powell, M., Siliezar, J. and Perkins, T. (2014). Challenges in developing integrated process models based on industrial survey data. In: 12th AusImm Mill Operators' Conference 2014: Proceedings. 12th AusIMM Mill Operators' Conference 2014, Townsville, Australia, (437-446). 1-3 September 2014. Francioli, Daniel, Yahyaei, Mohsen, Taveres, Luis Marcelo and Powell, Malcolm (2014). Characterizing attrition of rock under incremental low- energy impacts. In: Juan Yianatos, XXVIl International Mineral Processing Congress - IMPC 2014: Conference Proceedings. XXVII International Mineral Processing Congress - IMPC 2014, Santiago, Chile, (63-71). 20-24 October 2014. Yahyaei, Mohsen, Weerasekara, Nirmal and Powell, Malcolm (2014). Impact of mill size on low-energy surface damage. In: Juan Yianatos, XXVIl International Mineral Processing Congress - IMPC 2014: Conference Proceedings. XXVII International Mineral Processing Congress - IMPC 2014, Santiago, Chile, (53-62). 20-24 October 2014. Weerasekara, Nirmal, Yahyaei, Mohsen and Powell, Malcolm (2014). Interpreting low energy attrition behaviour in a pilot mill using numerical modelling. In: Juan Yianatos, XXVIl International Mineral Processing Congress - IMPC 2014: Conference Proceedings. XXVII International Mineral Processing Congress - IMPC 2014, Santiago Chile, (117-124). 20-24 October 2014. Saeidi, Fatemeh, Yahyaei, Mohsen and Powell, Malcolm (2014). New insights into comparison of breakage testing techniques. In: Juan Yianatos, XXVIl International Mineral Processing Congress - IMPC 2014: Conference Proceedings. XXVII International Mineral Processing Congress - IMPC 2014, Santiago, Chile, (124-135). 20-24 October 2014. Maleki-Moghaddam, M., Yahyaei, M., Haji-Zadeh, A., Asadi, H. and Banisi, S. (2014). Optimization of the design of AG mill shell liners at the Gol-E-Gohar concentration plant. In: Juan Yianatos, XXVIl International Mineral Processing Congress - IMPC 2014: Conference Proceedings. XXVII International Mineral Processing Congress - IMPC 2014, Santiago, Chile, (15-24). 20-24 October 2014. Maleki-Moghaddam, M., Ghasemi, A. R., Yahyaei, M. and Banisi, S. (2014). The impact of end-wall effects on the charge trajectory in tumbling model mills. In: Juan Yianatos, XXVIl International Mineral Processing Congress - IMPC 2014: Conference Proceedings. XXVII International Mineral Processing Congress - IMPC 2014, Santiago, Chile, (34-43). 20-24 October 2014. What is needed to develop the next generation of mechanistic breakage models in comminution? Chandramohan, R., Bonfils, B. and Yahyaei, M. (2014). What is needed to develop the next generation of mechanistic breakage models in comminution?. In: Comminution '14: 9th International Comminution Symposium, Cape Town, South Africa, (). 7-10 April, 2014. Yahyaei, Mohsen, Weerasekara, Nirmal and Powell, Malcolm (2013). Characterisation of abrasion breakage using multi size pilot mills. In: A. Kwade, S. Breitung-Faes and D. Steiner, ESCC 2013: European Symposium on Comminution and Classification. 13th European Symposium on Comminution and Classification, Braunschweig, Germany, (229-232). 9-12 September 2013. Moghaddam, M. M., Mohsen, Yahyaei and Banisi, S. (2012). A method to predict shape and trajectory of charge in industrial mills. In: Pradip (Conference President), XXVI International Mineral Processing Congress - IMPC 2012: Conference Proceedings. XXVI International Mineral Processing Congress - IMPC 2012, New Delhi, India, (3189-3203). 24-28 September 2012. Powell, M. S., Hilden, M. M., Weerasekara, N., Yahyaei, M., Toor, P., Franke, J. and Bird, M. (2012). A more holistic view of mill liner management. In: Peter Hills (Conference Chair), Proceedings: 11th AusIMM Mill Operators' Conference 2012. 11th AusIMM Mill Operators' Conference 2012, Hobart, Tasmania, (95-104). 29-31 October 2012. Parsapour, G. H. A., Hossininasab, M., Yahyaei, Mohsen and Banisi, S. (2012). Effect of mode of flocculation on flocs sedimentation behaviour in various regions of thickeners. In: Pradip (Conference President), XXVI International Mineral Processing Congress - IMPC 2012: Conference Proceedings. XXVI International Mineral Processing Congress - IMPC 2012, New Delhi, India, (4151-4162). 24-28 September 2012. Hasankhoei, A. R., Mohsen, Yahyaei, Mahdavi, A. and Banisi, S. (2012). Improving efficiency of the Shahre-Babak copper complex deep cone thickeners. In: Pradip (Conference President), XXVI International Mineral Processing Congress - IMPC 2012: Conference Proceedings. XXVI International Mineral Processing Congress - IMPC 2012, New Delhi, India, (1935-1943). 24-28 September 2012. Pirouzan, D., Mohsen, Yahyaei and Banisi, S. (2012). Pareto based optimization of flotation cells configuration using oriented genetic algorithm. In: Pradip (Conference President), XXVI International Mineral Processing Congress - IMPC 2012: Conference Proceedings. XXVI International Mineral Processing Congress - IMPC 2012, New Delhi, India, (4239-4251). 24-28 September 2012. Maleki-Moghaddam, M., Yahyaei, M. and Banisi, S. (2011). Converting AG to SAG mills: The Col-E-Gohar Iron Ore Company case. In: Ken Major, Brian C. Flintoff, Bern Klein and Kelly McLeod, Proceedings of an International Conference on Autogenous Grinding, Semiautogenous Grinding and High Pressure Grinding Roll Technology 2011. International Conference on Autogenous Grinding, Semiautogenous Grinding and High Pressure Grinding Roll Technology 2011, Vancouver, Canada, (). 25-28 September 2011. Ghobadi, P., Yahyaei, M. and Banisi, S. (2010). Optimisation of the performance of flotation circuits using a genetic algorithm orientated by process-based rules. In: XXV International Mineral Processing Congress (IMPC 2010) proceedings. XXV International Mineral Processing Congress (IMPC 2010), Brisbane, Australia, (1879-1890). 6-10 September 2010. Yahyaei, Mohsen and Banisi, S. (2010). Spreadsheet based modelling of liner wear impact on charge motion in tumbling mills. In: Congress Proceedings: XXV IMPC. XXV International Mineral Processing Congress - IMPC 2010, Brisbane, Australia, (1413-1422). 6 - 10 September 2010. Garmsiri, M. R., Haji Amin Shirazi, H. and Yahyaei, M. (2009). Introducing mathematical models to define settling curves in designing thickeners. In: Richard Jewell, Andy Fourie, Sergio Barrera and Jacques Wiertz, PASTE 2009: Proceedings of the Twelfth International Seminar on Paste and Thickened Tailings. 12th International Seminar on Paste and Thickened Tailings (PASTE 2009), Viña del Mar, Chile, (129-138). 21-24 April 2009. Banisi, S. and Yahyaei, M. (2008). Feed dilution based design of a thickener for refuse of a coal preparation plant. In: Proceedings of XXIV International Mineral Processing Congress. XXIV International Mineral Processing Congress, Beijing China, (1918-1932). 24-28 September 2008. Yahyaei, M., Hadizadeh, M. and Banisi, S. (2008). Modification of a SAG mill liner shape based on 3-D liner wear profile measurement at Sarcheshmeh copper mine. In: Dianzuo Wang, Proceedings of XXIV International Mineral Processing Congress. XXIV International Mineral Processing Congress, Beijing, China, (472-480). 24-28 September 2008. Yahyaei, M., Banisi, S. and Javani, H. (2005). Testing a flotation column at the pilot plant of Sarcheshmeh copper complex. In: 20th World Mining Congress, Tehran, Iran, (755-758). 7-11 November 2005. Mt Isa Copper Concentrator Improvement Projects (GLENCON4) Project 4: Deployment of additional grinding capacity. Mt Isa Copper Concentrator Improvement Projects (GLENCON5) Project 5: Regrind optimisation.